I've expressed plenty of skepticism for full-album concerts in the past, but I wasn't about to miss an opportunity to see Peter Murphy and David J play together on their first tour together since the last Bauhaus shows in 2006. 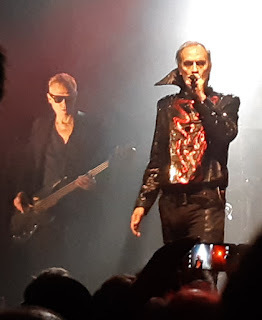 Although I have seen Murphy play some Bauhaus classics over the years, I missed my chance to see J's rock outfit at Levitation a couple years ago. If this is as close to seeing a reunited Bauhaus as I can get, I'll take it. These are two of my favorite artists and I've written a lot about both of them over the years. A band with a name like Desert Mountain Tribe could really go either way. At first, the roughly growled vocals and heavy sound had me worried that they were some bland hard rock band. However, I detected some nice psych and drone touches that piqued my curiosity. 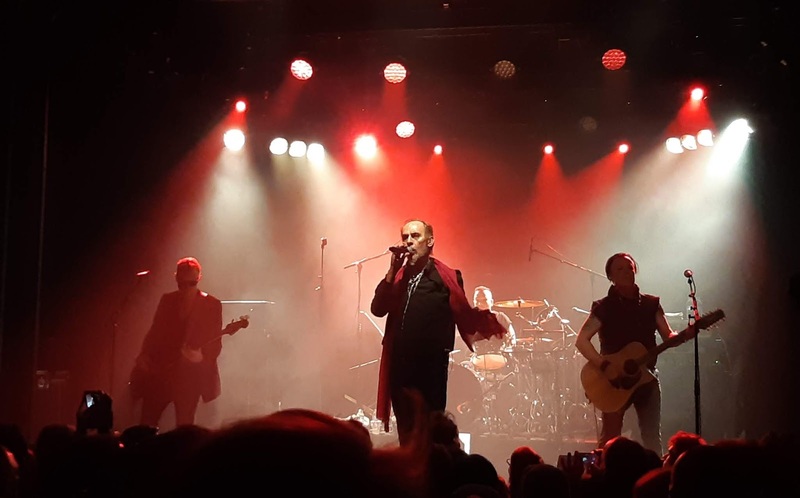 And then after just two songs, Peter Murphy appeared on stage! He sang two songs that coincidentally had bits of gothic rock guitar. He may have had to read some of the lyrics, but his soaring voice really made the songs hit home, and the audience was clearly thrilled. After he left, the band veered into a more Krautrock direction. I was oddly reminded a bit of Jesus & Mary Chain (simultaneously coarse but cool) and U2 (simultaneously grandiose but melodramatic). I liked their blend of styles, even if the individual songs didn't make a strong impression. They were great at building up their jams and maintaining a driving energy. I had always heard that Bauhaus were a powerful live band, and their live albums and bootlegs are reasonable proof of this. Seeing them live, or even half of them, is the real deal. Most of their songs (and particularly the opening trio of In the Flat Field) are propulsive, expansive, and dramatic. On stage, they were all the more captivating. Peter Murphy was in his element. He danced and moved with natural grace and perfectly played the role of a messianic glam-rock vampire. He connected with the crowd, sang every note with effortless ease, and filled the venue with his stage presence. His action was all the more enhanced by the stark, theatric stage lighting. The band backed up Murphy just as well as any recording of Bauhaus that I've heard. David J appeared cool and restrained, but his performance was spot-on. I've never seen him play bass, let alone fretless bass, but you'd never guess such a solid bassist could also be a folky singer-songwriter and guitarist. Frequent collaborator Mark Gemini Thwaite played guitar and joined J for the backing vocals. Unlike when I saw Thwaite with Murphy in 2009, when I criticized him as "no Ash, let alone Mick Ronson", this time around he was almost a match for Daniel Ash's erstwhile guitar flash. Drummer Marc Slutsky was also a suitable fill-in for Kevin Haskins; he was able to replicate both the energy of the intense songs and the unusual rhythms of weirder tracks. Choosing the strangest Bauhaus album is difficult, but In the Flat Field might take the cake. After blasting through the first three tracks, the band had to tackle six rather unconvential songs that had been largely ignored since circa 1981. "Dive" and "The Spy in the Cab" remained lesser tracks, but the band's patient meditation of the bizarre rhythm of the latter was enlightening to behold. (It took me years to realize that it was J's bass making the bleep sound and that that was basically the entirety of his part.) For "Small Talk Stinks", Murphy brought out a megaphone, presumably just as he did on the studio recording. He was clearly have fun with it in a way that was never quite apparent in the sarcastic bite of the original. He also used the megaphone to introduce "St. Vitus Dance", another opportunity for play and dance. "Nerves" required a sampled piano, but the taut precision and eventual release worked nonetheless. With only a brief pause, the band continued onwards as if they hadn't just played an entire album from start to finish. The first post-Flat Field pick was "Burning from the Inside", which has never been one of my favorites. While I could again appreciate the meditative simplicity of it, it always seems to go on too long. But after that, every song they played was a winner. Murphy, J, and company mostly stuck to the beloved classics from the original incarnation of Bauhaus, but they also threw in "Adrenalin", a solid rocker from their reunion album Go Away White (2008). "Bela Lugosi's Dead" might be an obvious choice, but I'd never seen any member of Bauhaus play it in full, and it was a dark delight. Murphy even used some sort of delay pedal to modulate the snare in a manner quite similar to the recorded version, except in stereo and to a much greater extent. "She's in Parties" gave Murphy a chance to play a melodica and even a bit of electronic percussion at the end. Meanwhile, J played a spirited take on one of my favorite dub jam basslines. "Kick in the Eye" was another funky highlight. For the encore, the band gave us a rendition of one of Bauhaus' first covers, the excellent "Telegram Sam". It was played in the same tense, amped-up style as their studio recording. Much to my surprise and delight, just as on the 1998 live album Gotham, they segued right into their (rather faithful) version of "Ziggy Stardust". Bauhaus might not be Bowie, but they did the best version of the song I've heard that didn't come from the Spiders from Mars. This was a rather transcendental experience. That seemed like a fitting end to the night, and some of the audience departed, but to my surprise, the house lights did not come on. 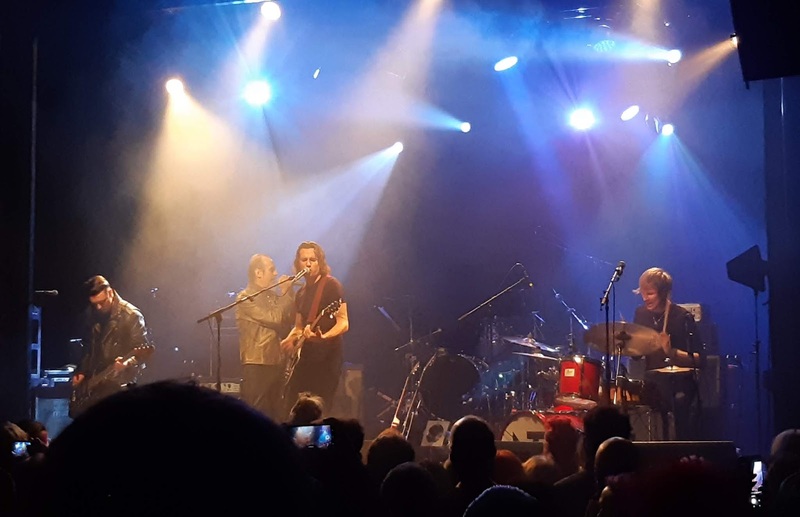 After a bit of a wait, the band came back and offered "Severance", the somber Dead Can Dance song that first appeared in Bauhaus' setlists during their first reunion in 1998. It was a beautiful performance with a grand crescendo. Murphy's vocals were sublime. This was an awesome show. I really wasn't sure how they'd pull it off, but Murphy and J were at their prime, and their bandmates were an excellent support. I've never seen Murphy perform at this level. Perhaps J's presence spurred him to greater heights, or maybe Murphy is just particularly well suited to the Bauhaus spirit, but whatever the cause, this show surpassed my high expectations.